This post is to jot down my whole process from preparing to get my braces done to finally gotten the braces on my teeth lol. 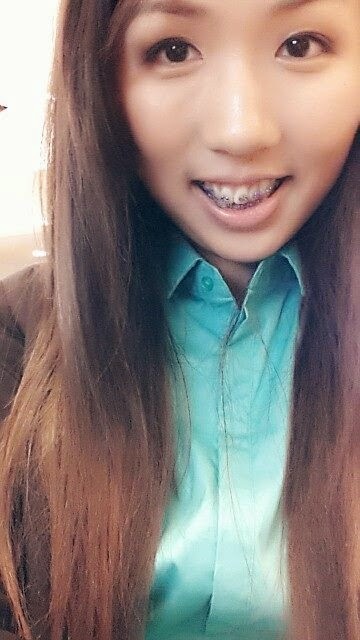 It's almost the 6th month of my braces journey and I have decided to post about my journey here. 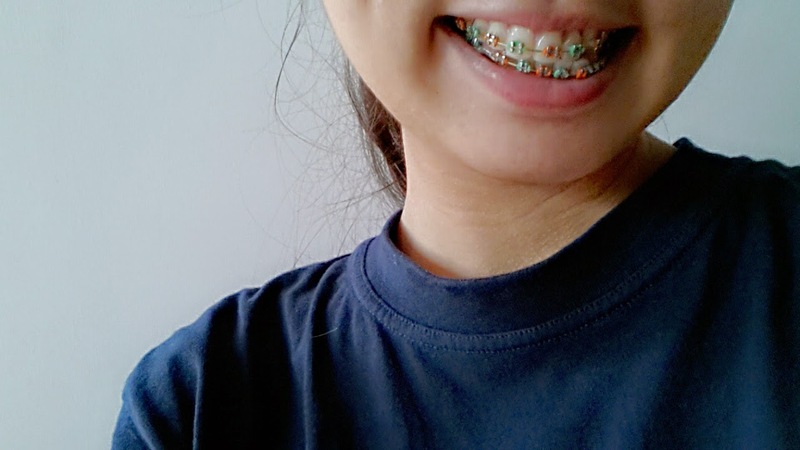 Have been taking photos of my colorful braces (my motivation to go for the dental appointment) so that I can monitor the changes and look back in the future. 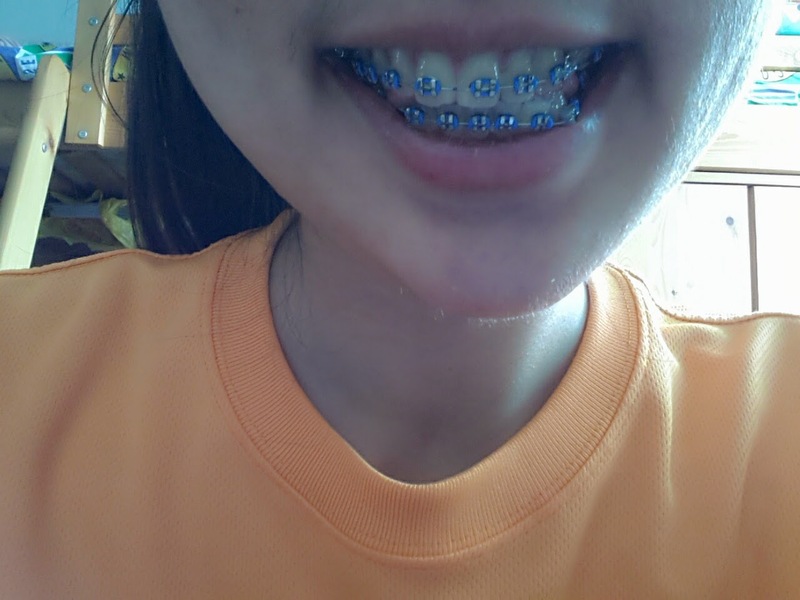 Chose purple for the 1st braces color because it's one of my favorite color. It was a painful start for me, given the fact that I have to pluck out 5 teeth, and 2 has to go under operations to extract them out. Before having braces, I know my teeth are not straight thus I didn't really like smiling in front of cameras when I was much younger. But as time passes, I gave up, and started smiling more with my teeth showing because it's tiring to hide. As you can see from some of the photos here, my teeth was horrible.... but that doesn't stop me from smiling/laughing/talking so ya. 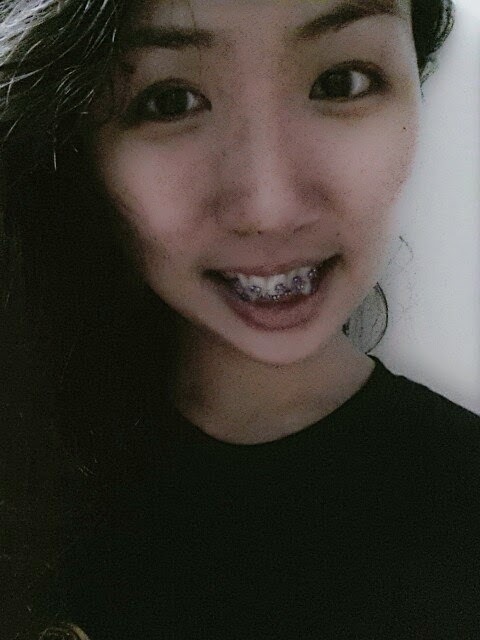 I was told by my dentist back then (in secondary 1) to put on braces. 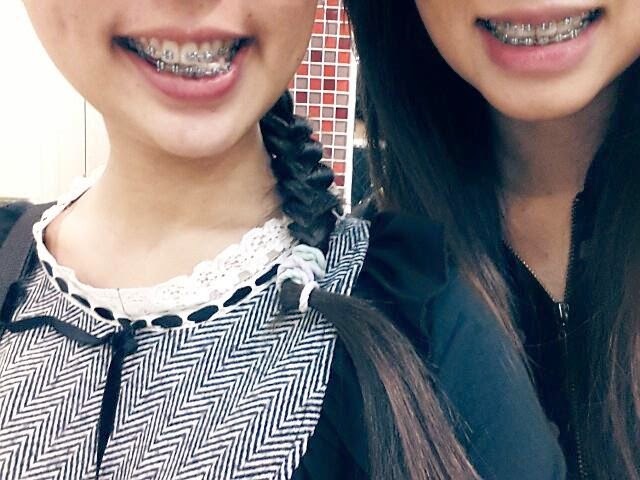 Braces back then wasn't a "trend" and what will people think when I put??? It didn't have much choices of colors to choose from back then except for the ugly sliver. Yes, stupidest reasons and I could have gotten nice straight teeth by now. So I took up the courage last November to finally get my braces done. I was asked to go to Khoo Teck Puat Hospital for extraction because it requires operation. 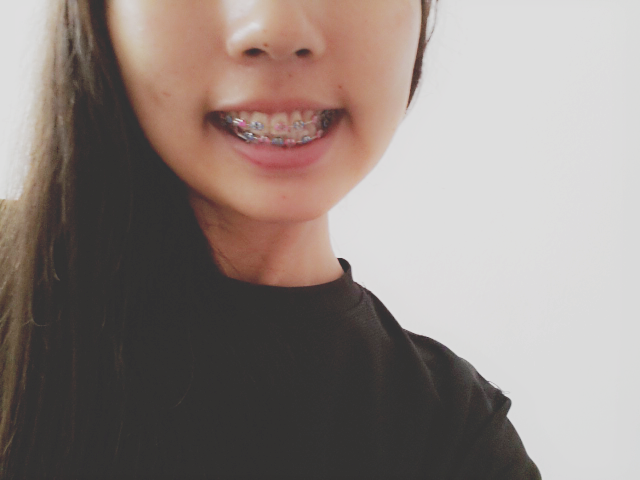 I was excited about this new journey of putting braces but the extraction still scares me a little. I can still remember the whole process of the operation because I was awake when they did the operation. E.g. the noise of the cutting of my gum & tooth etc. It took me a week or so to recover from the swell and I had a hard time eating. 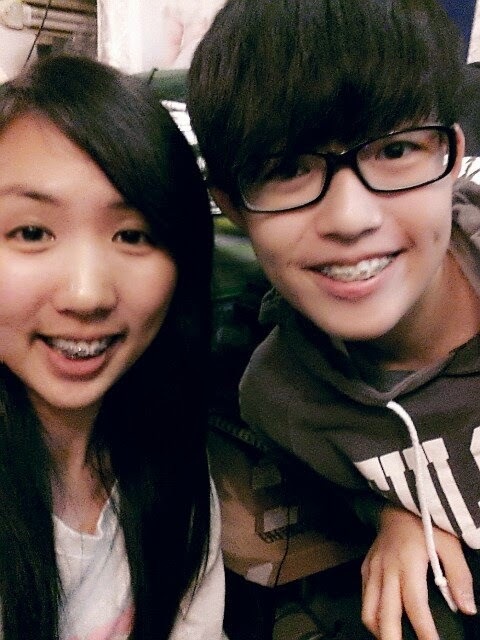 I attended lesson right after my operation because giving MC is such a chore. still remembered what was my teacher & friends reactions when they saw me with two cotton wool in my mouth and I forgot the doctor put my bloody tooth in my bag. I took out in the middle of the lesson (wanting to change my cotton wool).... and oops I scared my friend (who is a guy btw) hahaha. But I got to thank him because he helped me a lot that day, as I couldn't talk with my cotton wool inside my mouth, I had to write everything down and he was so patience with me and my annoying painful gums. I almost cried because it was too painful. Thank you everyone who has helped me in one way or another: cutting my food into smaller pieces so that I can consume, giving me encouragement before my operation, taking care of me when my gums hurt, asking me whether I can consume those food before ordering/visiting the restaurant, helping me to look for some soft food (like porridge) for me because I was hungry and I can't chew well, trying out which are the softer food so that I can eat and so much more. I feel really blessed to have you guys around in my life. Never ever choose black/yellow. Reason being very simple, you won't wanna look like you didn't brush your teeth and have yellow teeth or without teeth (which is why there are 'black holes'). Try to go for different colors every month because once you took out your braces, you will miss having colors in your mouth. Go for colorful ones if you want, the dentist will be nice enough to put it for you and won't scold you for it. Dark green may ended up looking like black so be careful! I was thinking either having green or orange (both are my least favorite color) thus I decided to have them both together - save the trouble of deciding. Hi, i chance upon your website and would like to ask where you did your braces and how much it cost :) is the service good? Thank you for sharing valuable information about Braces . Very Nice post. I enjoyed reading this post. How long did you have to wait to get yoyr braces on from your first consultation? 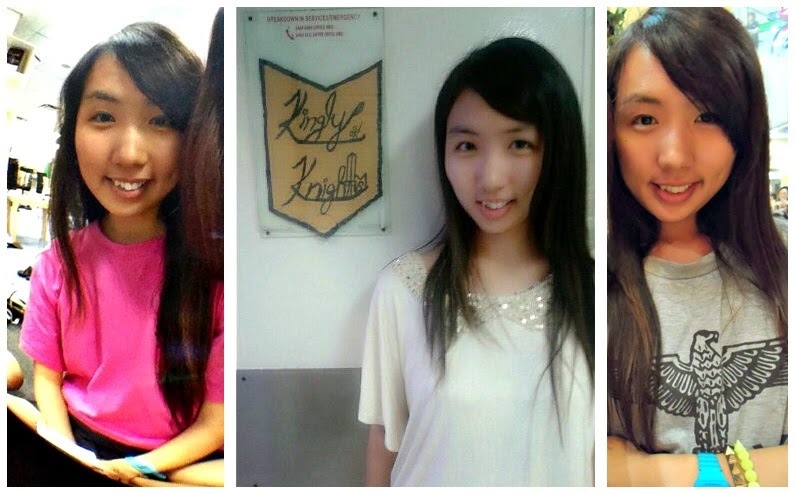 Thanks for sharing your braces journey with us. 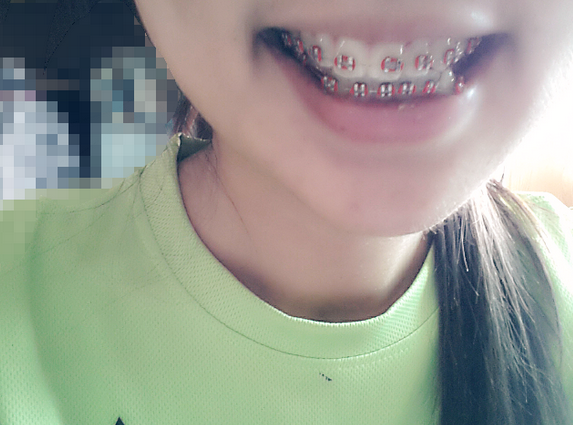 You look cute in braces. Now there are many color option are available. I really enjoyed your blog. Thanks for shairng such a nice braces journey I am also wearing Best Braces in Littleton Colorado Completely invisable Braces. I wish you find in your town.